Reliance Jio India Limited Jio premium apps roll out an update to one of their MyJio Apps. The apps have got several features like managing devices, generates a unique code to avail a Jio SIM card. Now JioJoin to Jio4G calling. 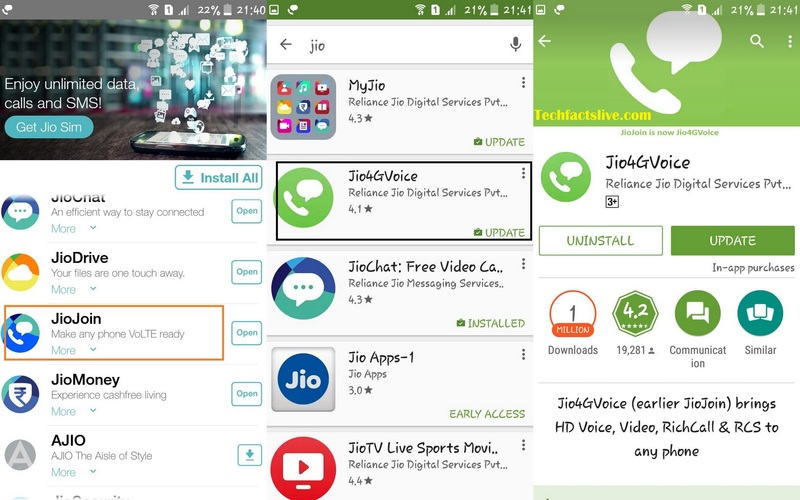 Now, Reliance Jio has started to send an update for its HD voice calling app JioJoin. The Very first notable feature is the name of the app has got a change to Jio4GVoice. The name suits aptly as the app features Voice calls. Reliance has changed the names of its Jio premium apps several times such as Jio Cinema, Jio TV, and JioMusic. This new update brings a list of changes which includes all new user interfaces which enhance the experience of the user. New dialer is quite intuitive when compared to the earlier one. The update is released last night, while users report that they received early this morning. The current version of the Jio4GVoice app is 4.0.4. It requires an Android device with a version of 4.0 or above to install in on Android smartphone. The new update also sport share feature such as maps, and doodle is also enabled while calling. Besides a great voice call experience on VoLTE handsets, the group chat option on this device now provides access to add up to 100 users in a group. Another Notable thing in this update is the Android N Compatibility. Reliance Jio has analyzed the needs of a user and added this new Android flavor which has been made official by Google. Besides this new user interface and changes, Jio4GVoice app now supports Indian language keyboard. An addition feature which grabs the interest of users is the option which connects call automatically when a user selects a profile and puts the handset near an ear. Summing all, it’s always good to see such new welcoming updates from Reliance Jio 4G.